Born on 15 March 1867, at Carlton, Nottingham; the illegitimate daughter of Elizabeth Leaper (father unknown and not listed on the birth certificate. Elizabeth has signed the birth certificate with an x). Maria was the 6th of Elizabeth’s 8 children. Harriett Leaper (1852), possibly died in the 1870s. 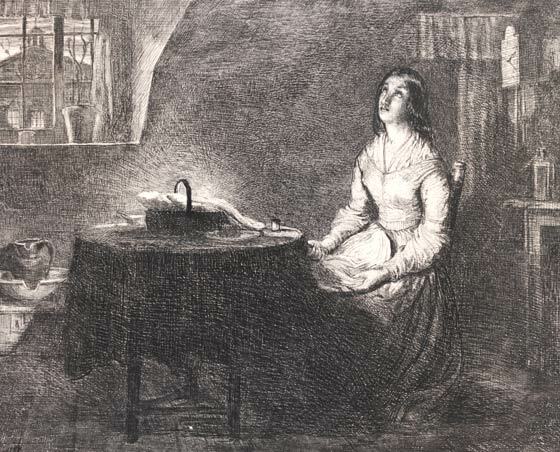 Emma Leaper (1855), who married Frank Clarke and had 6 children. Arthur Leaper (1858), who married Annie Underhill and worked as a coal miner. Sophia Leaper (1860), married Thomas Berresford, and moved to Heanor where they had 4 children. Frederick Leaper (1865), who worked as a brick maker. Catherine Leaper (1869), who married James Straw and had at least 5 children. Clara Leaper (1871), who married John Barker. She was baptised on 12 July 1868 at All Hallows, Gedling. In 1871 Maria lived with her mother, a seamstress and siblings at Newgate, Carlton. Emma and Arthur worked as Cotton hands, and her mother had taken in a boarder (Henry Paddle). Newgate, Carlton no longer survives in 2006, but there is a New Gate Close, off Green Hill Rise. New Gate may have been in this area and destroyed for re-development. Unfortunately I am unable to trace Maria on the 1881 census, where she has moved out of her mother’s home. But by 1887 William Osborne had met Maria Leaper, and their daughter Roseanor (Rosina Leaper) was born out of wedlock in the summer of 1887. The couple married on Christmas Day in 1887. Their daughter “Sally was born in 1890, and around 1891 William and family moved to Heanor, due to the growth of the railways in that area, as in 1890 the Midland Railway opened a branch line from Ripley to Heanor (Midland Road), with station at "Crosshill & Codnor", and in 1891 Great Northern opened a line from Ilkeston to Heanor (Heanor Gate), with station also at Marlpool. 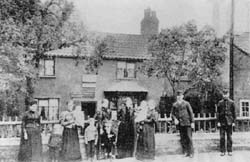 The family had set up home on Loscoe Rd, Heanor. By 1892, they had moved back to Carlton, where their son Hunter was born on 25 December 1992, followed by William (1895), John (1898) and Maggie in 1901, In 1901 they were living at Park Road Carlton. After her mother’s death, in late 1901 they moved into the newly built home on ORlando Drive, Carlton. Maria was known to have worked as a dressmaker, and raised 6 children. Sadly their son William (jnr) died in 1911. Maria died 1928 age 61 at Carlton, Notts. Elizabeth Leaper was born at Carlton, Nott’m in 1832 to parents Samuel Leaper and Catherine Hutchinson. 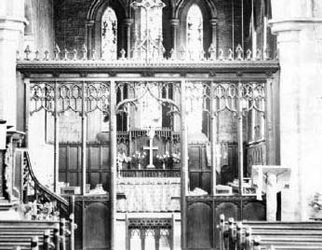 She was baptised on 12 August 1832, at All Hallows, Gedling. Nottingham. She was the 3rd of the couple’s 6 children. Ann Leaper (1827 – 1896), who had illegitimate son James in 1849, she worked as a lace runner. She went on to marry John Meakin in 1869. Jane Leaper (1829 - ) she worked as a seamstress. She married George Roulston in 1856, and George Goodwin in 1870. John Leaper (1835 - ) spent all his life working as a servant, and never married. 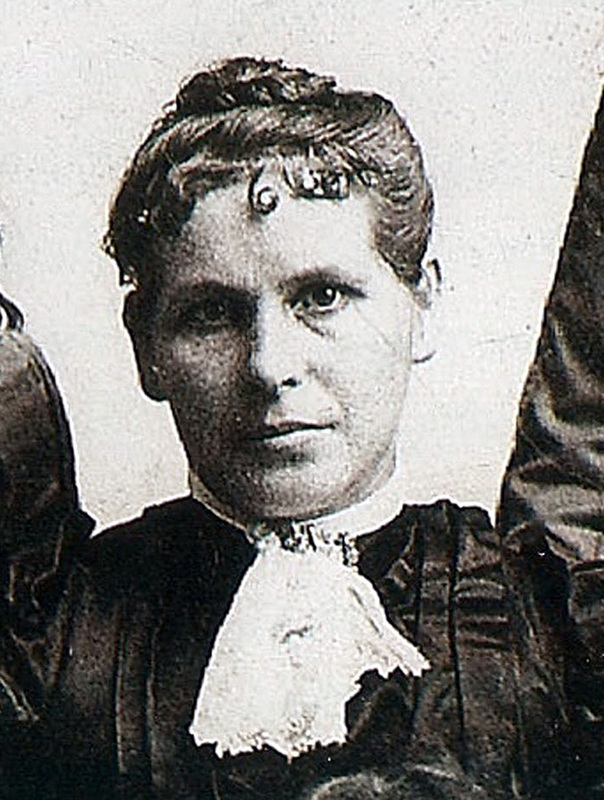 Harriett Leaper (1840-) who had 2 illegitimate children. She worked as a seamer. Esther Leaper (1844) who worked as a seamer. Elizabeth grew up in the Carlton area of Nottingham, the daughter of an agricultural labourer. The stocking frame had been invented in Calverton by Parson Lee who sent a pair of stockings to Queen Elizabeth I, probably hoping that she would grant him a Patent. She was not enthusiastic. 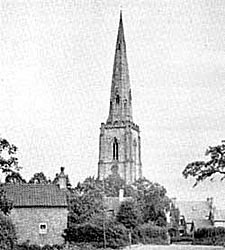 But Stocking Knitting took a hold in Carlton, and as a result the population increased to such an extent, that the old Parish of Gedling was divided, and Carlton became a separate parish. 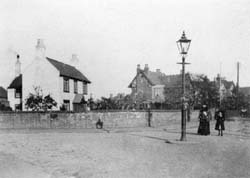 In the middle of the nineteenth century there were 12 stocking frames at work in Gedling, but only one in 1844, although there were 426 in Carlton. By the time of the 1861 census, Elizabeth had moved out the family home, having had her 1st child Harriett in 1852, age 20, followed by Emma (1855), Arthur (1858), and Sophia (1860). She was the head of the household, in Carlton, with 4 children under 10, supporting her family by working as a seamstress. In 1865 she had son Frederick, followed by Maria (1867), Catherine (1869), and Clara in 1871. In the 1871 census, her address is New Gate, Carlton and in addition to her 7 children she has also taken in a lodger called Henry Paddle, to help finances in addition to her working as a seamstress, and children Emma and Arthur working as cotton hands. 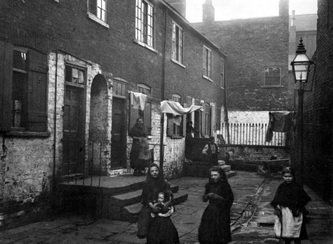 By 1881, she had moved to the Worth’s Yard area of Carlton, which is near Mount Pleasant. She wasn’t working, but possibly looking after her grandson Leonard, who was 1 year old, whilst her children Emma, Arthur, Sophia and Frederick all went to work. In the 1891 census Elizabeth is living alone at Askins Yard, Carlton, and not working. However it is likely she was supported by her daughters Catherine and Clara who were both neighbours. She stayed at Askins Yard until her death in 1901. In the mid-19th century, clothing manufacture was still entirely in the hands of small traders. Milliners and dressmakers occupied the higher end of female ‘needle-employment’ and at least one operated in every village, while towns abounded with them. Needlework was seen as a natural profession for women because it was sedentary and was traditionally performed for the care and maintenance of the family. Within this industry, a woman might be an employee, an apprentice, a sole proprietors or an employer. A sole proprietors would perform the work in her own home. If she prospered, assistants would be engaged and, at some point, depending on the size of her house, she might move out to a workshop or have one built on to the house. Samuel Leaper was born 1802, at Gedling to parents William Leaper and Mary Swinscoe (Or Davinscoe). He was baptised At Gedling on 5 Sep 1802. I think he was the 4th of the couple’s 5 children. John Leaper (1789 – 1869) a Frame work Knitter he married Sarah Greaves and had one son. On the 18 Feb 1827 Samuel Leaper married Catherine Hutchinson at Gedling, only months later on 24th June 1827, their first child Ann was christened, showing Catherine was pregnant with Ann at the time of their marriage. They set up home in Carlton and Samuel took employment as an agricultural labourer, which he did into his 70s. The couple raised 6 children, Ann (1827), Jane (1829), Elizabeth (1832), John (1835), Harriett (1840) and Esther (1844). Catherine died in the 1860s, and their daughter Esther continued to live at home and support her father until his death in 1879, age 77 in Carlton, Nottingham. In the early decades of the 19th century, agriculture was frequently depressed and rural poverty great. Workers with a particularly useful trade or experience would often hire themselves on this basis because they could demand good wages, and farmers might vie with each other to get the worker they wanted. This was the case quite often with people such as plough-team leaders and very experienced cowmen. It seems that some of the most highly valued jobs (those involved in handling livestock the teamsman who looked after the horses, the yardsman who cared for the cattle and the shepherd) often had a cottage made available to them. Wages for the least secure, most poorly skilled or least experienced farm workers were very low. The struggle for existence can best be illustrated by the loss in value of wages. In a fifty year period in the late 18th century, wages rose by only 25 per cent but the cost of living increased by 60 per cent. Wages were usually low, and were not infrequently paid in the form of goods or food, or the labourer was allowed a small plot of land to raise vegetables and perhaps to keep a pig or two. The pig was fattened and then killed in the late autumn, to be salted or smoked as a source of meat through the winter and early spring. The conditions of the agricultural labourer reached a very low ebb by 1815, but things got worse. The end of the wars meant that many ex-soldiers were unemployed. 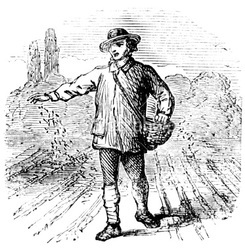 Grain prices fell and farmers lowered wages; a landowner-dominated Parliament passed the Corn Laws, which prevented the import of grain until the price of English wheat reached 80 shillings a quarter. It is not surprising, therefore that discontent, fuelled by steep rises in the prices of bread and flour during the post-Napoleonic wars depression, led to violence. Rioting occurred in 1816, with the anger directed at property, machinery in particular. Ricks (stacks of hay, corn or peas, often thatched [roofed with straw] for weather protection) were burned and threshing machines broken. The latter were depriving labourers of valuable winter employment and consequently were much hated. Further rioting broke out in 1830 as again farm workers demanded rises in wages and the abolition of threshing machines, twenty-nine of which were smashed. The surname Leaper appears to originate from the Nottinghamshire and Yorkshire counties. The Notts marriage CD lists the name Leaper back to 1600's in the Lowdham, Stapleford, Mansfield areas of Nottinghamshire. William Leaper was born at Arnold, Nott’m to parents Thomas Leaper and Elizabeth Bancroft. He was the 3rd of the couple’s 5 children. William Leaper married Mary Richardson at Gedling on 11 Oct 1758. Mary would have been pregnant with her daughter Mary, at the time she married as her daughter was christened at Gedling in November 1758. William and Mary stayed in Gedling and raised their 6 children.